As we drove through the rugged scenery of the Burren district in north Co Clare, Galway Bay was constantly in view, and as we moved on to see the Cliffs of Moher it was inevitable that we would end up at Doolin, a popular departure point for the Aran Islands and also the village that is at the heart of Irish traditional music. Doolin is a seaside village on the north-west coast of Co Clare, surrounded by the rugged in Burren district and facing out to the Aran Islands and the Atlantic Ocean. 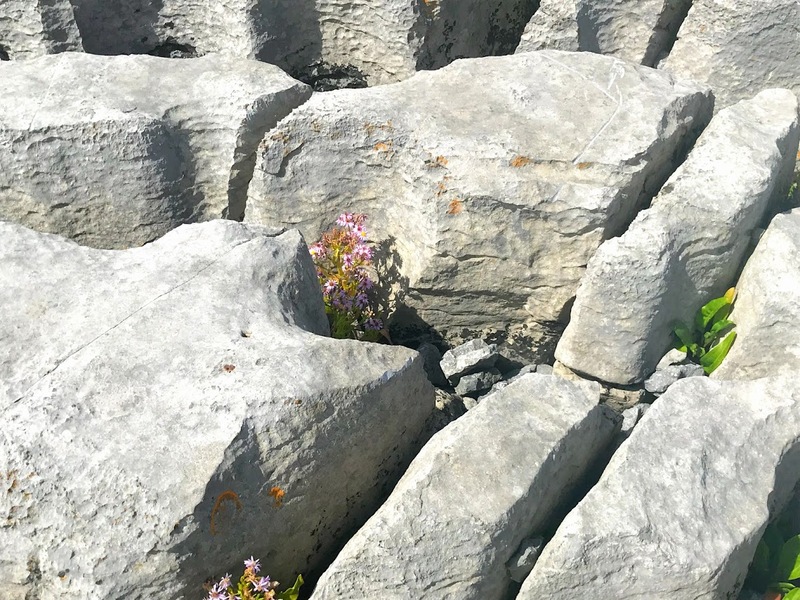 Doolin was once a fishing village, but today it is a base for exploring the Cliffs of Moher and the Burren. 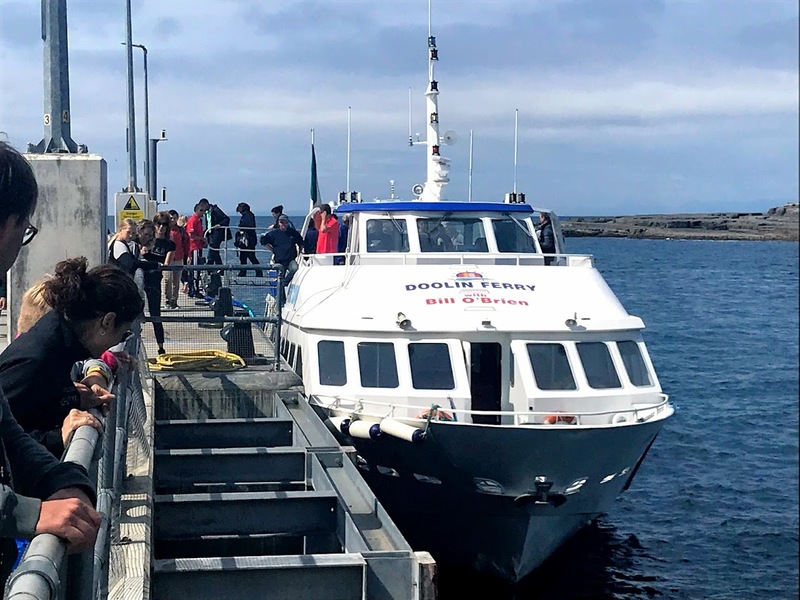 It is a busy place in these summer months, with people catching ferries to the Aran Islands or boarding boats for tours of the Cliffs of Moher. Doolin is also at the heart of Irish traditional music, with a reputation built on the work of musicians like Micho Russell and continuing in the live music and spontaneous singing in pubs and bars. But the range of restaurants, shops and accommodation makes Doolin popular all year round. Doolin also offers many activities ranging from sea angling, caving and scuba diving to pitch and putt, rock climbing and hill walking. Doolin is also surfing destination, and a break that generates Ireland’s biggest wave, Aill na Searrach, is just off the Cliffs of Moher. There are many archaeological sites nearby, some dating to the Iron Age or earlier. Doonagore Castle and Ballinalacken Castle are also in the area. The harbour at Doolin is the departure point for boat trips to the Aran Islands and the Cliffs of Moher. Fisher Street has a pub and several shops and hostels. Fitz’s Cross has a hostel, campsite, hotels and a pub. Roadford has pubs, restaurants, hostels and accommodation, and trips to Doolin Cave also run from here. The Great Stalactite in Doolin Cave measures 7.3 metres. When it was discovered in 1952, it was recognised as the longest stalactite in the Northern hemisphere. 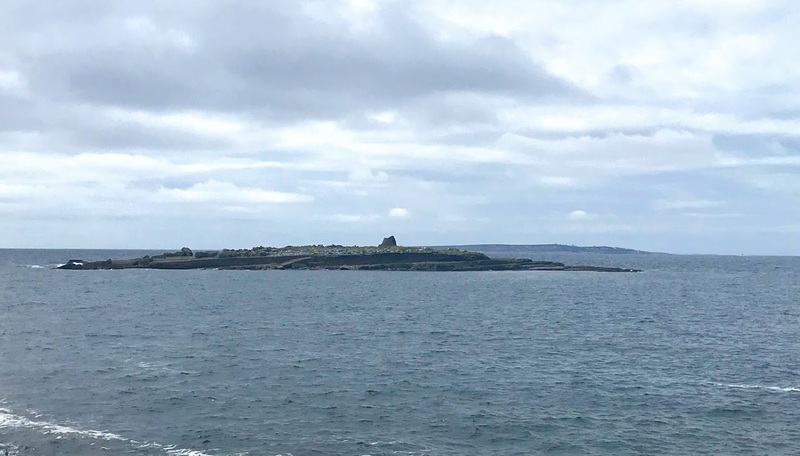 A short distance out from Doolin Harbour, Crab Island is barren except for the remains of a 19th-century stone police outpost. 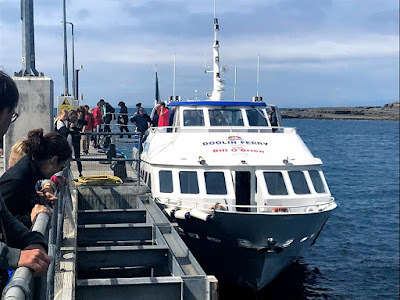 The Aran Islands can be seen further out from the harbour and Doolin is one of three places with ferry services to the Aran Islands – the others are Galway and the village of Rossaveal on the north-west shore of Galway Bay. From Doolin we drove 7 km south to the Cliffs of Moher on the south-west edge of the Burren. 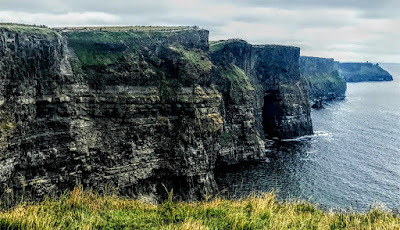 The Cliffs of Moher continue for about 14 km. At their southern end, they rise 120 metres (390 ft) above the Atlantic Ocean at Hag’s Head, and reach their greatest height – 214 metres (702 ft) – just north of O’Brien’s Tower, and then continue at lower heights, always with the edge abruptly falling away into the churning Atlantic below. O’Brien’s Tower was built as an observation tower on the Cliffs of Moher in 1835 by Cornelius O’Brien (1782-1857), a benevolent local landlord who was MP for Co Clare (1832-1847, 1852-1857). When O’Brien built the tower, he planned it as an observation tower for hundreds of tourists who then visited the Cliffs of Moher, so they could see out to the Aran Islands. Today, the Cliffs of Moher are among the most visited tourist sites in Ireland, attracting about 1.5 million visitors a year.